CEANI promotes application development in areas like modeling, computational calculation and simulation, optimization and reliability. This happens in a multidisciplinary framework, solving problems that can be interesting to industries, enterprises and institutions. It also supports industrial development through applied research and technologic transfer. 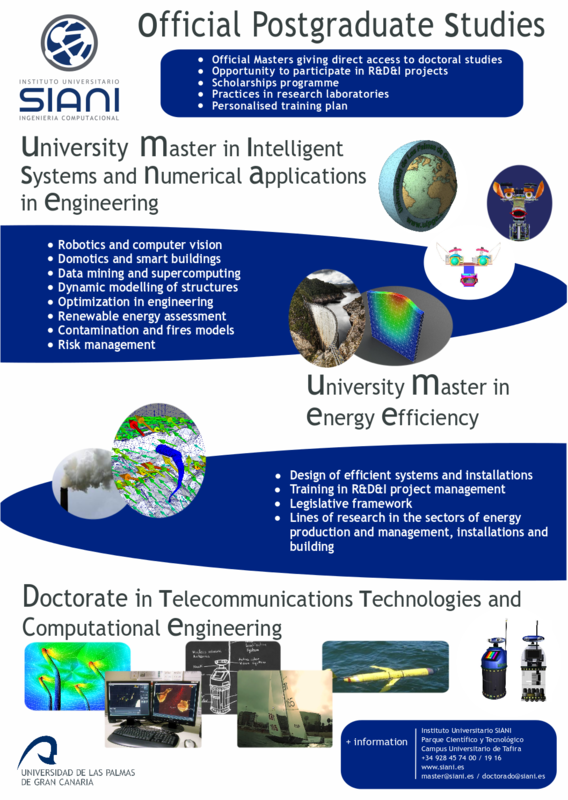 Promotes, organizes and coordinates activities related to knowledge creation and transmission and also makes to know how simulating, optimizing and reliability fields are and their applications focused in Engineering: Conferences, courses, symposium, meetings, sessions, research and final projects, etc. CEANI was born from a main core of material and human resources from the Research General Service also called CEANI because of their old denomination of Engineering Numeric Applications Centre. Since 1992 they have made some working lines in the fields of Modelling, Simulating and Optimizing and since 1996 the reliability line (trustworthiness, availability, security, risk probabilistic assessment and optimal predictive maintenance). Since their launching there have been made more than 200 conferences, 60 international scientific publishing and 20 research and develop projects. As well they have organized more than 50 conferences about numeric simulation and application optimization to scientific-technologic-related problems. In the website http://ceani.ulpgc.es appears a detailed compilation of the research staff, doctorates and scholarship holders, as well as their published documents and projects. In this document there are described the division’s objectives and their main lines of research. As well we enclose a table that contains the main part of the projects and later there are counted the most relevant publications in the recent years. · Mathematic modeling of engineering problems. · Numeric problems simulation. Among others, fluid dynamics (different fluid regimes, shocks, etc.) with physic-chemical problem applications in environment. · Heuristic search algorithms, mainly, genetic algorithms with industrial interest problems applications. 1. Optimal design or redesign of protection, security and reliability systems. Fail tolerant systems. Facilities’ maintenance optimizing: Optimal maintenance planning: against fire, explosions, gas leaking and radioactive or bacteriologic contaminant in hospital and clinics. 2. Optimal decisions before some conflict objectives. Application to industries and enterprises. Transport optimization (optimal routes, planning, production-distribution, and storage. Global logistics optimization). 4. Industries and services optimal location. Optimal location of discharge points, wind turbines, hospitals, etc. 5. Simulation and environmental control, impact minimization: wind energy, atmospheric contamination, marine contamination and ground water. 6. High-complexity problem computing and simulation: environment, industrial design, bio-medics design, aeronautics, process engineering. Bioengineering: Biomedical devices related to traumatology and orthopaedics design and constructing with compatible materials (internal and external fasteners for bone injuries healing, internal prosthesis, slabs, nail systems, etc. ), alloy covering for implants, bone geometry reconstruction and artificial heart valve design.